I’ve posted a lot of recipes lately that have strawberries, but there is a good reason – they’re in season! When you’re at the store and strawberries are $1.30 for a pound, instead of $4 – that’s your sign that they are in season! Now, I’m not kidding myself into believing that they aren’t grown in hot houses, BUT at least it’s the season for them, and in my mind, that makes me feel like they taste better. I wanted to make a strawberry crepe, so I looked up a simple crepe recipe, and where it called for 1/2 cup of water, I added a 1/2 cup of strawberry puree instead, plus a bit more water to thin it out. My strawberry puree was made-up, too, as was the strawberry-vanilla bean whipped cream! You need to make your crepe batter the night before you use it, so make this batter tonight and have crepes in the morning while the weekend is still here! This recipe looks like a sugar bomb, but it actually wasn’t. The crepes have zero sugar except the strawberry puree, which only has 3 tbs and it’s also used to sweeten the whipped cream. So if you don’t add the chocolate sauce, this is really low sugar! And it definitely doesn’t taste like you held back! In a 10″ non-stick, shallow skillet, heat teaspoon of butter over medium high heat, or just spray with non stick spray, but you want your pan to be pretty hot. Add a quarter cup of batter to the pan and swirl around till it’s spread as thin as possible. THE FIRST CREPE IS ALWAYS CRAP. Just throw it away. Now, you’re ready to begin. By 1/4 cup scoops, (I used a ladle) swirl your batter in the pan very quickly and let it set for at least 1 to 2 minutes before flipping. If your pan is hotter than mine, you may need to alter your time. With a wide spatula (I used a fish spatula), slide under the crepe and flip over. The other side won’t take as long to cook. Keep finished crepes covered in a towel so they will stay warm and pliable. This batter made about 8-10 crepes for me, but if you’re really skilled at swirling your batter, you could squeeze 15 crepes out of this amount. I am not skilled and my crepes are always thicker than they should be, but they’re still delicious! 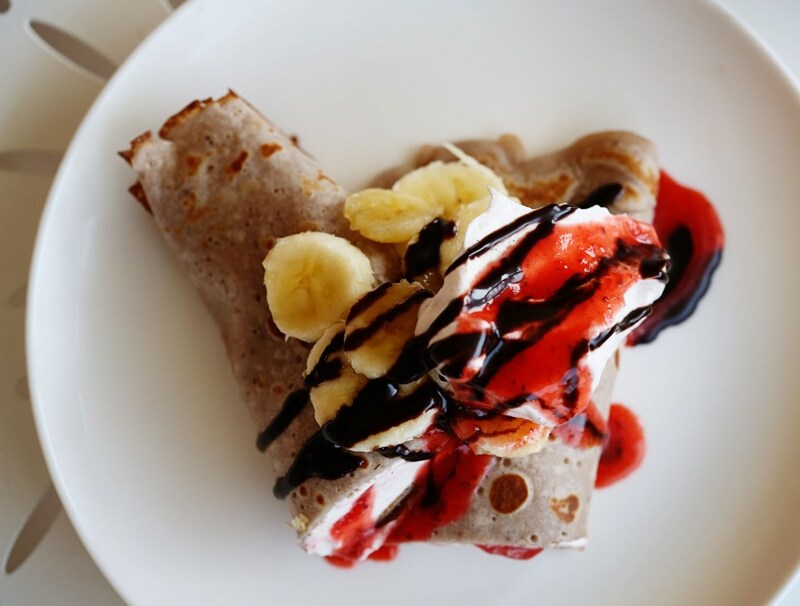 Fill the crepe with sliced bananas, a drizzle of left over strawberry puree, and a dollop of whipped cream. Add more strawberries and whipped cream on top, and if you’re feeling the entire banana split thing, drizzle in chocolate syrup (I used Torani chocolate syrup.) Or even some toasted pecans! Have fun – it’s the weekend! Place all the ingredients into a medium saucepan and cook over medium low heat till bubbly. Cook for about 15 minutes until the strawberries begin to break down. Remove the vanilla bean and transfer to a blender or a tall cup with your immersion blender and blend, with an extra 1/2 cup of water till fully blended and no chunks remain. Add the vanilla bean paste or vanilla extract (about 1 tsp) if you want and blend again. This entry was posted in Breakfast, Desserts, Eggs are Awesome, Weekend Fare and tagged banana split, bananas, breakfast, crepes, dessert, low sugar, strawberry crepes, strawberry puree, strawberry whipped cream. Bookmark the permalink. 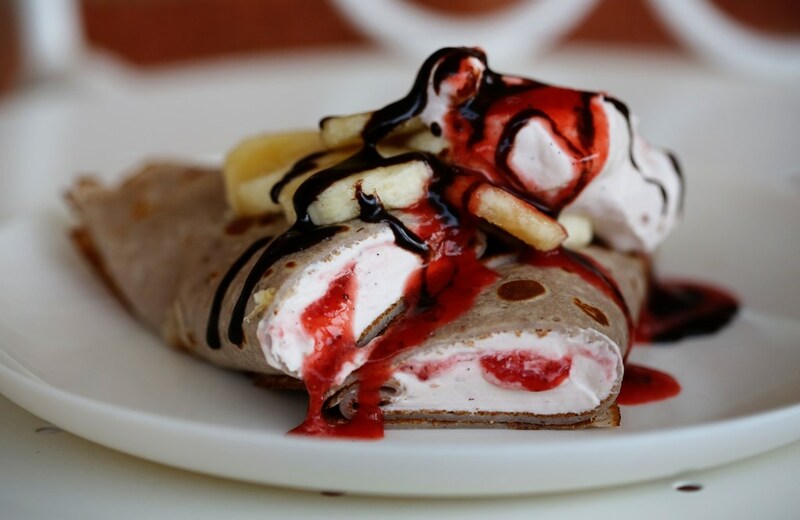 I love the idea of banana split crepes! These look and sound so delicious!